I had grandma, Dad and Rob over for lunch last week so the salmon cakes were a quick and delicious meal for everyone to enjoy. Boil a small pot of water. Add potato and cook until tender, 10 min. Drain and mash well in a medium bowl. Add salmon (including bones and skin) to potato and mash with a fork. Stir in eggs, onion and lime pickle. Season with fresh pepper. Form into 6 patties (mixture all be moist). Pour panko into a deep dish. 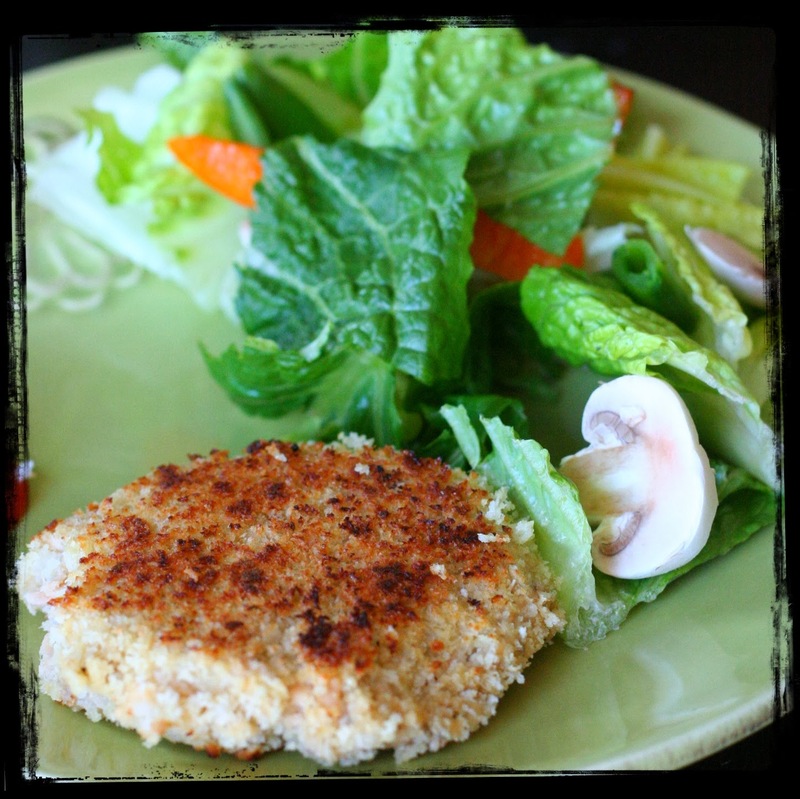 Coat patties with panko. Heat a large non-stick frying pan over medium-high. Add 1 tbsp oil, then half of salmon cakes. Reduce heat to medium. Cook until golden, 2 to 3 min per side. Repeat with remaining oil and salmon cakes. Stir yogurt with cilantro in a small bowl. Serve with salmon cakes. Alterations: I didn't have an Indian lime pickle so I used lemon and dill to season these salmon cakes. I have also used crushed cornflakes and breadcrumbs in the past to make the cakes. It is very messy to make and I have found that mixing in the breadcrumbs or crushed cornflakes in with the mixture and then making the cakes is much easier. 1. In large saucepan, heat oil over medium-high heat. Add mushrooms, garlic, carrot, bell pepper, and onion. Cook until vegetables are very brown and soft, about 15 to 20 minutes, stirring frequently. 2. Add wine; cook 1 minute, stirring constantly. Use wooden spot to scrape browned bits from bottom of pan. 3. 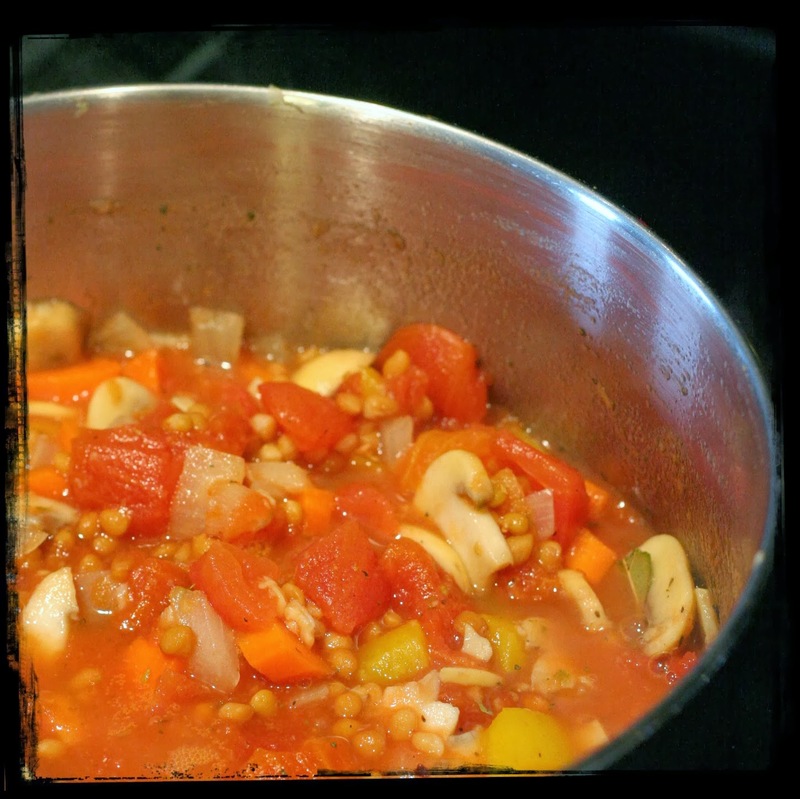 Stir in bay leaf, crushed tomatoes, water, lentils, oregano, salt, black pepper and red pepper flakes. Heat to boiling, then reduce heat to medium-low. Simmer until lentils are tender, about 25 minutes, stirring occasionally. Add more water, as needed, if ragu gets too thick. Remove bay leaf and stir in basil. 4. Meanwhile, prepare spaghetti according to package directions. 4. Serve ragu over spaghetti. Garnish with parsley and serve with Parmesan cheese. Alterations: I didn't use red wine since of course I didn't have it on hand and if I did, I would have drank it. I used beef broth in its place. Also, I used canned lentils (drained and rinsed) and thus did not add any extra water. I just had a yellow pepper so I used that instead of the green pepper. I also didn't have fresh basil so I had to use dried. The meal turned out great. To complete the meal I added a side spinach salad with strawberries and a glass of milk. It was delicious but I think using the red wine and fresh herbs would have made this meal taste even better. The girls devoured this meal, so that made me happy. This meal was delicious. Full of flavour and so tasty. Highly recommend it. 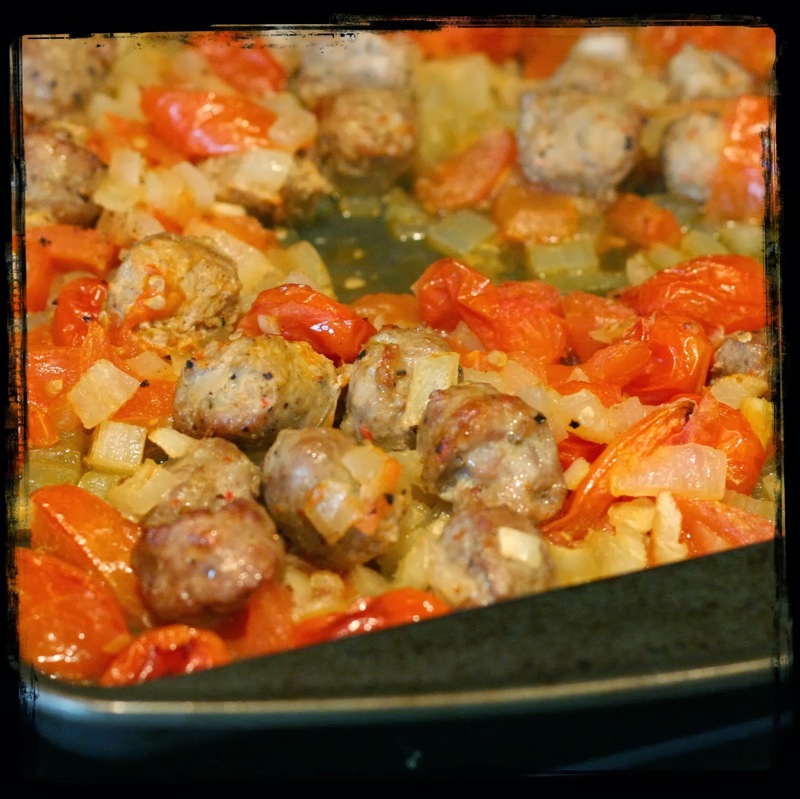 Toss the tomatoes, onions, garlic, sausages, and olive oil together. Season to your taste with salt and pepper. Transfer to a roasting pan and place in the oven. 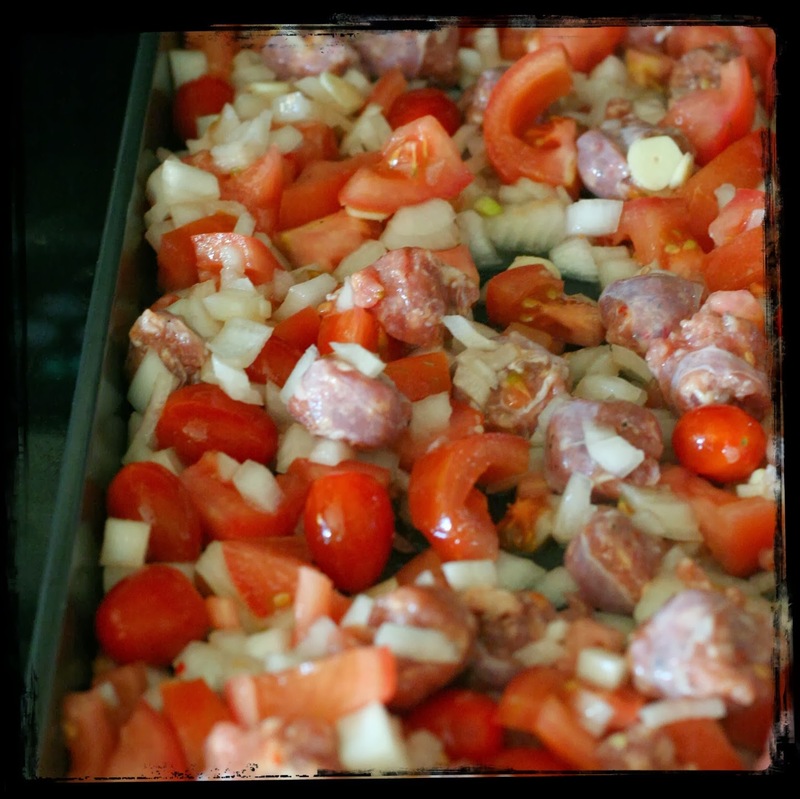 Roast the tomatoes, onions, and sausages are lightly brown and smell amazing. 30 to 45 minutes. When the tomatoes are nearly done, bring a large pot of salted water to a full rolling boil. Dump in the penne and cook until edible, stirring occasionally. After 10 minutes or so fish out a piece and bite it. At first it will be too firm, but in just a few minutes it will transform, so continue fishing and tasting until you like the texture. Pasta is best when it's tender enough to eat but hasn't become to soft. 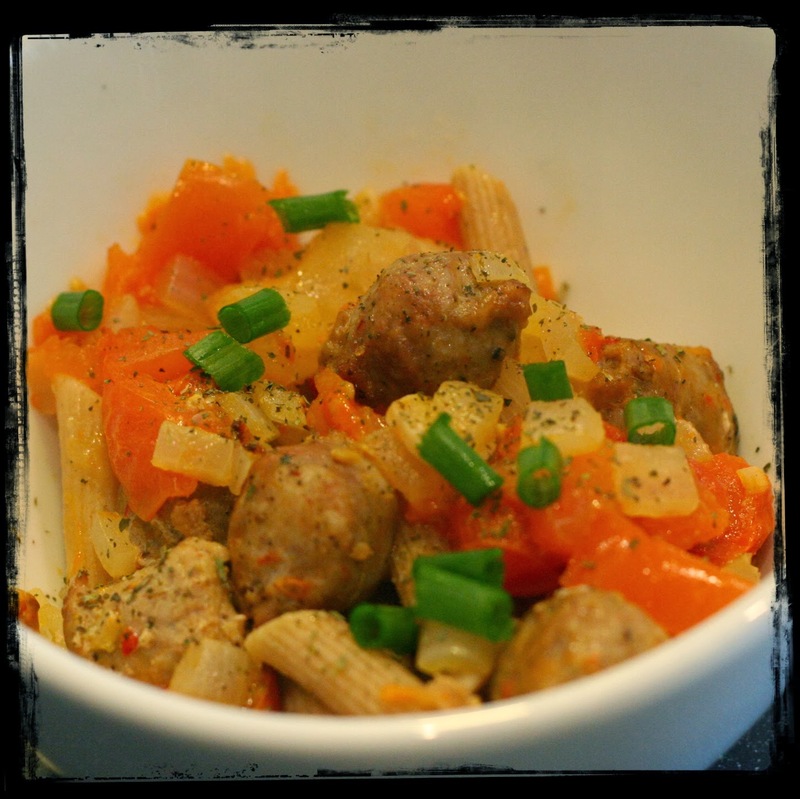 Great pasta retains lots of pleasing chewy texture. While the pasta is cooking, stack a tall pile of basil leaves, roll it into a tight cylinder, and slice as thinly as possible. Slice the green onion as well. As the pasta finishes cooking, add a ladleful of the pasta water to the roasting pan. The moisture will dissolve any caramelized brown bits of flavour on the bottom of the pan. When the pasta is done, drain it and return it to the pot. Add the roasted sausages, onions and tomatoes, scraping along evert last bit of roasted flavour from the pan. Toss the basil leaves and green onions and stir everything together. Serve and share!